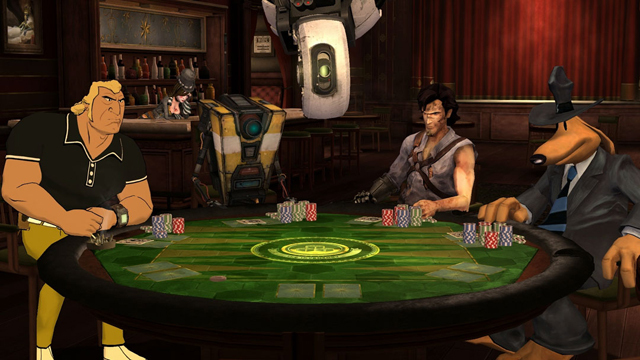 Telltale Games’ downloadable poker extravaganza Poker Night 2 is well on its way to an April release. In the meantime, the folks behind the scenes have release a brand new trailer showcasing the many unlockables, collectibles and other attainable schwag stuffed with licensed goodness. The cross-promotional voodoo will allow you to customize your character in Borderlands 2 with a variety of aesthetic touches pulled from the other members seated at your virtual table. Poker Night 2 features Brock, the berserk bodyguard formerly in the employ of Dr. Venture of Adult Swim’s The Venture Bros. Filling the remaining seats are Claptrap of Borderlands fame, Ash from Army of Darkness and the six-foot anthropomorphic canine with a nose for crime, Sam, of Sam & Max. Dealing the cards and high-stakes action is none other than GLaDOs, the murderous artificial intelligence. In addition, Poker Night 2 offers platform-exclusive rewards for in-game play. Players who clean out the house on Xbox Live Arcade will be treated to a variety of avatar gear to deck out your digital self. Still not enough freebies? Well, Poker Night 2 features in-game unlockables to boot, allowing you customize nearly every aspect of the game as you play against the odds in Texas Hold ‘Em and Omaha poker. To take a peek at everything that’s on the table, check out the trailer after the jump.